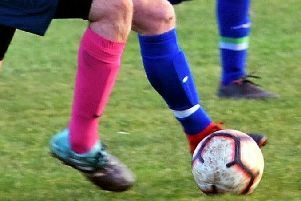 Beaten, but not defeated - there was no disgrace in Rothbury’s League Cup exit at the defending Premier Division champions, Benevolent Bowl holders and runaway League leaders. To go out to a side that is averaging almost six goals a game in the top flight of Alliance football, on their own ground, was to be expected in all honesty. But to concede just twice, and with one of those coming from the penalty spot inside five minutes, showed just how far this Coquetdale side has come – and can go. The Students got an early break as Olly Walkden stepped up to hit the opener from the spot. If they hoped that would open up the floodgates they were mistaken and didn’t add to their tally until Conrad Zylko put away number two five minutes after the interval. “The teamwork and discipline was tremendous and a credit to the squad’s character -the shape and work rate is probably the best we’ve produced this season. “But also, we didn’t change our style and we tried our best to play short to feet as we always do, despite the really high press from the Uni. They worked really hard to stop that passing but the lads didn’t give up with it,” continued the manager. Herron was impressed by the contributions of midfielders Tony Brown and James Jackson, whose confidence on the ball and dictation in possession helped Rothbury to move play around, while also crediting the defenders for holding their shape and frustrating the hosts throughout. “I think the Uni were surprised at the levels we produced and were frustrated when just 1-0 up as we really limited them to shots from outside the box. 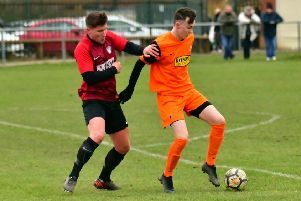 Former Alnwick Town ace Brown relished the opportunity to display his skills on the Kimberley Park pitch and revealed that a rousing half-time rallying call from Gareth McCann had helped stoke the fire in the Hillmen’s bellies. “A few of the lads were quite down at half time as we thought we should be have went in at least level, but Gaz McCann’s ‘defend our beaches’ speech was a real pick me up,” he said. “We’re disappointed to go out the cup, but I think we gave a really good account of ourselves against a team that have brushed aside everyone before them in the Premier Division this season and will probably win that league at a canter,” continued Brown. “I thought we passed the ball really well, the work rate to a man was excellent and the most pleasing thing was we stuck to our guns despite going behind in the early stages. The result took the Uni into their third semi-final of the campaign and ended Rothbury’s Cup interest for the season.